NC Meat Mom Delivers Grass-Fed Beef - JP loves LIFE! 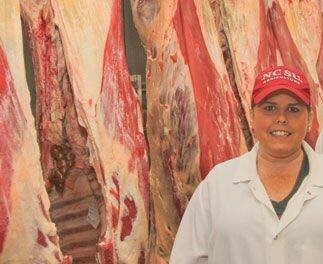 Amy H. Robinette is the owner of Micro Summit Processors and co-owner of Harris-Robinette Beef, and is known online as NC Meat Mom. Her family farm and meat processing company are east of Raleigh in Micro, NC. I was recently in her neighborhood without realizing how close I was and I’m still bummed we didn’t have a chance to meet up. Reading her story, I’m sure I would have enjoyed it! Growing up on a third-generation tobacco farm in Eastern NC, I was taught the importance of family, farming, and faith at a very early age. My husband Patrick and I have incorporated these values into our own family as owners of Harris-Robinette Beef, a completely grass-based cattle operation, headquartered on this same land. While my husband manages our day-to-day cattle business, I recently left my job as a teacher and now serve as the sole owner of Micro Summit Processors, a slaughter and processing facility located in Johnston County. Together, my family strives to bring humanely-raised and processed meat to North Carolina. We are a bit unique since my husband and I were one of the first grass-fed cattle producers in North Carolina. We started our business by selling wholes and halves directly off our farm, and we have grown to include numerous restaurants and dining services, including b.good restaurants, Savannah School of Art and Design, and Bi-Lo grocery stores throughout South Carolina. Becoming a member of American Agri-Women and serving as the president for our NC chapter has allowed me to network and form lasting friendships with women in agriculture from across the country. I get to learn about potato production from a single mom in Washington, ask questions about the dairy industry from my friends in Wisconsin, and share cattle stories with my colleagues in the Midwest. These ladies not only educate me about our country’s diverse ag production, but they also inspire me to do more on my own farm and community. 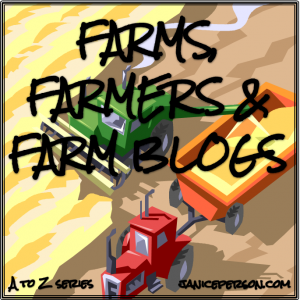 If you have missed any of the previous posts in the Farms, Farmers and Farm Blogs A to Z series, you are really missing out! I’m just thinking about how many awesome farmers have been featured so far! You get to know various parts of the country and various crops. Lots of fun! Feel free to catch up on the awesome folks already featured in this project.